Mr. Snuffleupagus, a.k.a. Snuffy, is Big Bird's big, brown furry friend on "Sesame Street." If a wooly mammoth mated with a dinosaur, and they were both sweet as pie but dumb as a bag of hammers, you might get Snuffy. It was great for Big Bird to have a pal, especially one who took up just about as much room as he did and didn't have to bend down to talk to him, but there was a weird twist. For years, only Big Bird could see his pal, and the grownups on the show didn't believe him and thought he was an imaginary friend. Seriously, have you SEEN the Muppets? A big brown woolly mammoth thing is no weirder than or less capable of being your best friend than a green furry thing who lives in a trash can or an odd little bug family who resides in your flower box. Why Snuffy was singled out for disbelief was never clear, and really, it was kind of frustrating, like your mom's friend who insists on acting like your name is "Mabel" when it's totally not and you've corrected her every day of your life without end. Eventually you just grit your teeth, smile, and write her off as a nutcase. It wasn't until 1985 when the "Sesame Street" grownups finally got to meet Snuffy, and it was for a well-intentioned, if creepy reason. That was when all those McMartin Preschool-style child abuse cases were rising up, and there was a big movement to believe what kids told you, not to dismiss or doubt them. (This applied only to kids born to Baby Boomers, of course. We Gen Xers, the Rosemary's Baby generation, got the shaft as always.) But anyway, the "Sesame Street" adults met Snuffy, apologized for thinking Big Bird was a big ol' liar, and we moved on. Also? Snuffy's first name is ALOYSIUS. Like having the last name "Snuffleupagus" wasn't bad enough. And his parents apparently got a divorce, but that episode never aired. Kids hated it and found it disturbing, and from the Wikipedia description, I don't blame them. Here's the video where he's finally revealed as real. What say you? Snuffy--love him or hate him? My mom was born in 1946. The end of the Baby Boomers. I was 14 when Snuffy became "real." I remember it clearly even if I hadn't watched the show in years. However, technically I was a child of a Boomer and a Gen-Xer, so I didn't get the shaft as you describe. 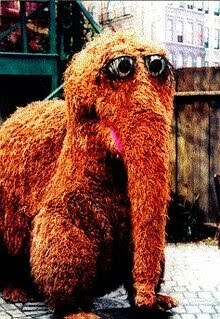 I loved Snuffy as a kid. I had a stuffed Snuffleapagus that my mom made me sell in a yard sale and I mourned its loss for years. He's still a favorite of mine, although I was too old for his "reveal" (and I'm kind of glad I was--I think that's why I liked him so much, because he was imaginary).